The content on the about page could be broken up into sections. On the planning page there is a flash video, so there is an opportunity to use the video element with flash fallback for non-supporting browsers. In the footer the two h6 elements would be better as smalls, and as the links in the footer could be considered main navigation they could be dropped into a nav. Aren’t there some cool html5 ways to do that? JC, there’s @font-face for that. Correct Bruno, @font-face does extend the ranges of fonts available in a browser, but it is CSS, not HTML5. Why would you want to control text rendering through HTML? That’s CSS’s purpose. Sorry Bruno I didn’t make myself clear. jc asked if there was a way to render fancy text using HTML5, and you answered @font-face. 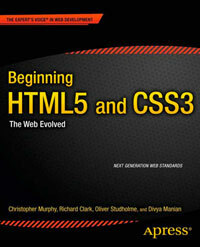 I was pointing out that it is CSS which is not HTML5. You wouldn’t want to control text rendering through HTML. Ah, yes. It’s just that lately I’ve been hearing a lot of people use HTML5 as a catch-all for all the new generation web development technologies, including HTML5, CSS3 and the new JS APIs (in fact, that’s the meaning they give to it at http://slides.html5rocks.com), so I just assumed jc meant any new generation way of styling text. My bad.